Do your eyes often feel dry or itchy? Do you sometimes have irritated, or blurred vision? 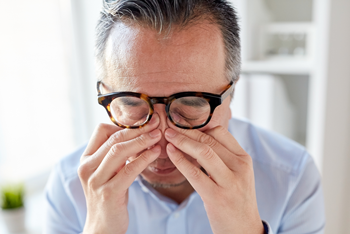 You may be suffering from dry eye syndrome (DES). Dry eye syndrome is a chronic disorder where your eyes do not produce or maintain enough tears to adequately lubricate the eye surface. Symptoms range from a gritty, or foreign body sensation in the eyes, to burning, irritating dryness. You can also have excess watering as the eyes try to maintain their moisture balance. DES often occurs with age, but can be exacerbated by hormonal changes (as with pregnant or menopausal women), taking oral contraceptives, or using drugs such as antihistamines, antidepressants, or blood pressure medications. Our modern world, with its electronic devices, such as computers, tablets, and cell phone viewing, plays a role in fatigued and dry eyes as well. As does heat and air conditioning, medical conditions such as diabetes, arthritis and lupus, and thyroid disease. People who have had eye surgery, including laser vision therapy, and those who have worn contact lenses for many years, are also vulnerable to DES. Comprehensive eye exams are key to diagnosing DES. Treatment can greatly help symptoms, so It’s important to inform your eye health professional of any dry eye symptoms. Often, optometrists will administer tests to measure how quickly tears evaporate from the surface of the eye. One test, called the Tears Break Up Time test, uses a simple dye an optometrist administers before counting the time it takes the eyes to clear the dye. A longer clearing time indicate a lipid, or oil deficiency in the tears. This likely means the oil glands in the eyelids are not working properly. The Schirmer test is another diagnostic tool performed less often the the tear test. For this, an optometrist places a strip of paper under the eyelid to determine the amount of moisture on the strip. Newer, more specific and state of the art tests include the OCULUS Keratograph 5M imaging system which takes external images of the eye and examines the Meibomian glands (on the eyelid) in a less invasive way than the dye tears break up test. It is also less irritating and gives an accurate measurement and evaluation of the lipid layer, the tear layer on the surface of the eye. The I-PEN Tear Osmolarity System is another highly accurate diagnostic tool used by some optometrists. It is a hand-held “pen” that detects and measures the oil lipid concentration in surface tears. It too gives an accurate and comfortable measure for dry eye diagnostics and levelling. There are several treatments for dry eye syndrome. Some involve simple self care, such as lubricating drops, warm compresses, using humidifiers or avoiding long stretches in front of electronic devices. Another include inserts with lubricating fluids. Treatment methods and their effectiveness are greatly enhanced when accompanied by an accurate, personalized diagnosis by your eye health professional. To book your assessment and consult please visit Dry Eye Clinic page.